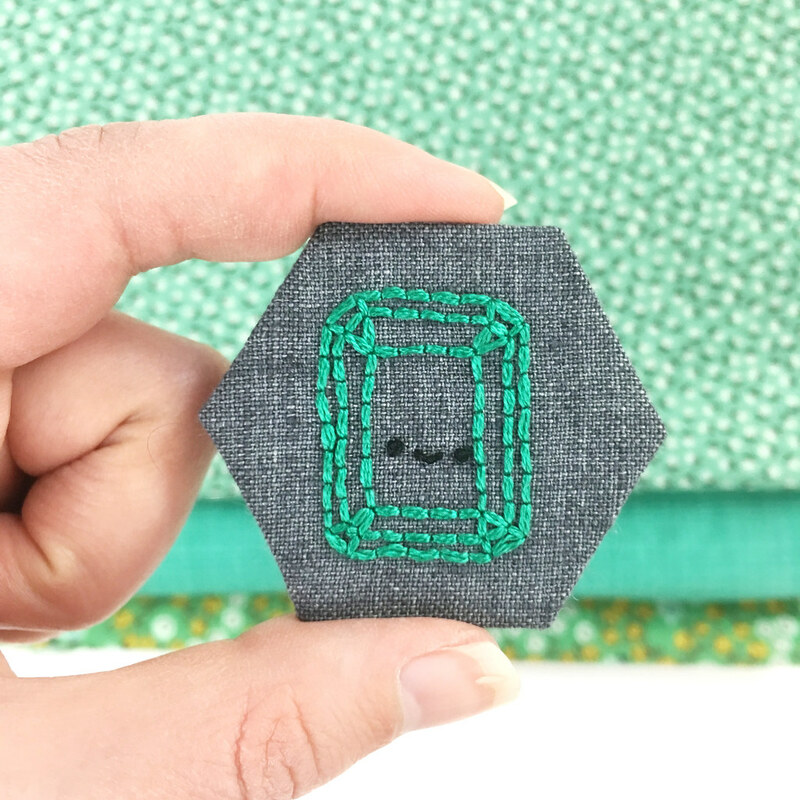 We're five months into 2018 and this free birthstone-themed stitching club. And it would seem that mid-month is when these patterns release, regardless of when I'd like the patterns to show up. But hey! You've had a free pattern every month so far, so let's call that a win. 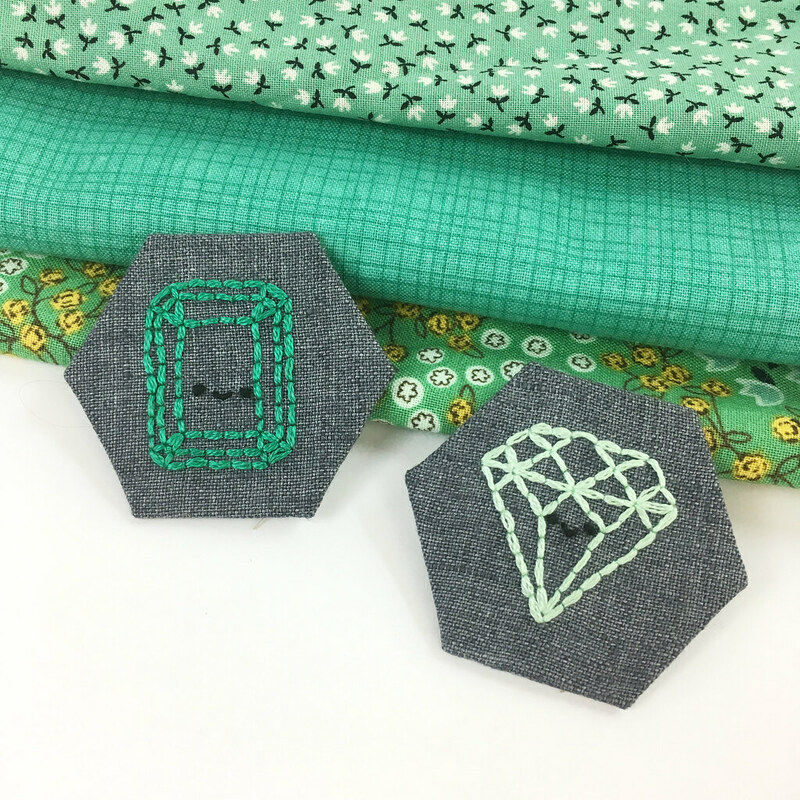 This month we're stitching an emerald-cut emerald. Of course, with all these patterns, you could really make them any stone you want. You're really getting a total of 12 gemstone shapes! I chose a blue-ish emerald green for my stitching (DMC 3850), which I love the look of. It's almost a dark teal. The tricky part was when I went looking for fabrics to match so I can add the EPP half hexagons around this, I realized that I have a severe lack of emerald fabrics. Typically my favorite greens have more yellow, and the rest are truly teal. Not wanting to buy more fabric (pause: that's a lie...I almost always want to buy more fabric), I decided to make it work and found a few that I think give it an emerald feel. I also managed to finally stitch a wonky April diamond! And none have their EPP surrounding them yet. But they will. And remember, you can access all the #WildOliveStitchingClub birthstone patterns, including the layout for a special birthday placemat. I'll share more about how that goes together later in the year. I promise! This is a beautiful design, keep up the great posts.